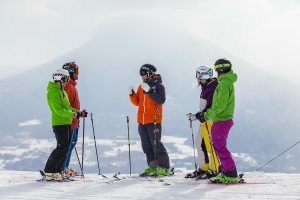 Niseko Base Snowsports (NBS) is Niseko's premier all in one Snowsports School, Kids Club, Rental & Retail Center located at the base of Family chairlift! Niseko Base Snowsports (NBS) is Niseko’s premier all in one- Ski & Snowboard School, Kids Club, Rental & Retail center. Located in a prime ski in- ski out position, the Alpen Ridge NBS store offers a variety of adult & child, group & private lessons, quality rental gear from big brands and a retail store stocking all of the must have snow accessories to keep you warm, safe and looking good on the snow! The team at NBS are passionate skiers & snowboarders and we look forward to sharing our knowledge and experience to ensure that you have everything you need for a great time on the snow.